It's traditional and modern. The all-new Palazzo Bird Feeder combines the classic lines of Eastern design with contemporary Western flair. 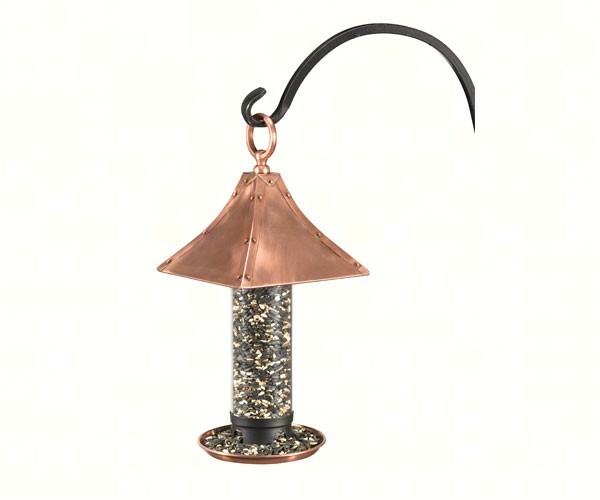 This easy-to-clean tube feeder, is topped with a polished copper, pagoda-style roof. Handsome rivets embellish each edge for a distinctive, eye-catching effect. The lipped feeding tray — with convenient drain holes built in — prevents waste and keeps seed dry for your feathered friends and very desirable for Cardinals with its platform type tray. Measures 7-1/2"L x 7-1/2"W x 15-1/2"H. Holds 1-1/3 pounds of seed.